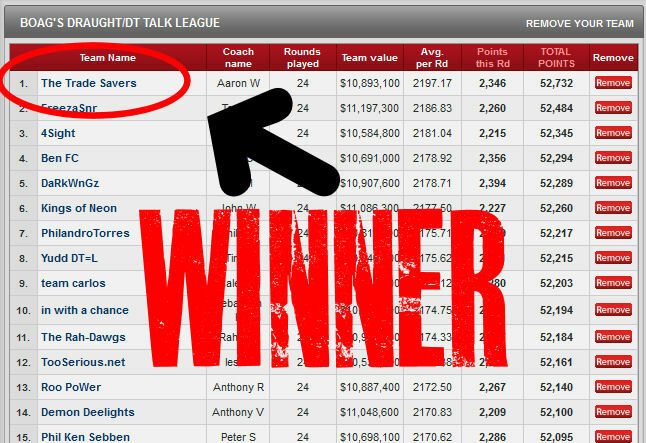 Congratulations to Aaron W, the coach of The Trade Savers for winning the Boag’s Draught / DT TALK Group for 2011. His prize is a day on the Boag’s watching some footy with us blokes in their nearest capital city. Congratulations to Aaron W, the coach of The Trade Savers for winning the Boag’s Draught / DT TALK Group for 2011. His prize is a day on the Boag’s watching some footy with us blokes in their nearest capital city. We will confirm these details early next year and hopefully we get a chance to catch up with a few DT coaches and film a DT episode. Well done Aaron on finishing 5th overall for the year too. A massive effort. I feel for Ben…… he had it in the bag until finals where he got two below par scores and not only lost the group and got out of the top 10 but lost in my league in the semi final after dropping one game for the whole season! poor guy…. Get set for the penultimate round before tonight’s 5:20pm AEDT lockout. It’s definitely the business end of the season now! Get set for round 16. It’s a super-early lockout this week, make sure you’re set.